Dr. Ignacio Valencia nominated as a Philly Mag Health Hero! 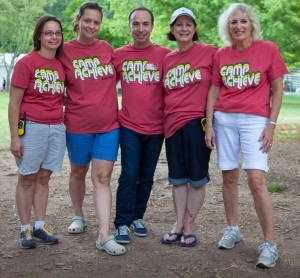 Dr. Valencia, center, with the 2014 Camp Achieve Medical Staff! Dr. Ignacio Valencia has been nominated as a Philadelphia Magazine Health Hero! Dr. Valencia has been involved with the EFEPA for years–as a member of our Professional Advisory Board, as a speaker at Conferences, a participant at the Summer Stroll and, above all else, a member of the Camp Achieve Medical Committee and volunteer at Camp! The EFEPA is so excited that his commitment to his patients and the epilepsy community is being honored. The Health Hero Challenge, sponsored by Independence Blue Cross, is an annual contest to honor local champions of health and wellness. Beginning in October, they begin our reader voting rounds, when you get to vote for your favorite among 16 semifinalists, as chosen by Philadelphia magazine editors. The Challenger who receives the most votes will be crowned the 2014 Health Hero, and he or she will be honored at a blow-out celebration, featured in Philadelphia magazine, and win a $3,000 donation to his or her charity of choice. Dr. Valencia has chosen the EFEPA as his charity of choice! Dr. Valencia will be featured in the first round of voting, from October 7-13th. If you’d like to see Dr. Ignacio be named the 2014 Health Hero, you can vote for him on the Health Hero facebook page, https://www.facebook.com/BeWellPhilly any time between October 7th and October 13th. Vote Today!